• The specs of the furnace must meet your needs exactly. If it is to small it will not heat your home effectively, and too large will run too frequently- thus raising your utility bill, wearing down parts to quickly, and creating a temperature in the home that is uncomfortable. Not to mention if your air ducts are designed for a smaller furnace than the one you purchased, the flow of the air would be loud throughout the house and cause excessive wear on the ductwork. • Choose a well-known and trusted contractor to purchase from and install your furnace. Some companies may try to sell a unit that is more than what you need just to make an extra profit. You want someone with experience that will come out to your home and evaluate what you really need. • Consider energy efficiency. Check out the furnace's annual fuel utilization efficiency rating. This is a % that will tell you how efficiently it uses energy. This number is common among gas furnaces. • Think about the various options that are available on furnaces, make a list of wants and needs. You may want to consider getting variable speed blowers on your furnace so that the air moves through your home slowly. This will create less noise at times when not as much heat is neede. It also results in fewer problems with keeping the temperature at a comfortable level inside your home. Variable heat outputs and air filtration devices are also features you should look into. 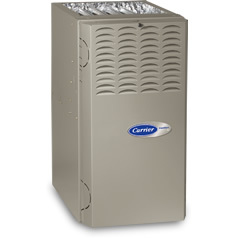 • Most often it will actually save you money to replace your furnace earlier rather than later. Old furnaces do not operate at the level of energy efficiency that those made today do, so you might want to consider replacing an old furnace simply because of its age. If you're unsure whether you should repair a furnace or if replacing it is the better option, call in a trusted technician to evaluate the furnace. It could be as simple as changing out a filter or if a main component has gone out then you will need to replace it. A new furnace will definitely be an expense, but one that will actually save you money over time. The cost of running a furnace that is energy efficient is far less than running an older unit. New furnace installation is definitely an expensive investment but once you installed it will give you comfort whole summer. But one thing always keep in mind always go for routine service and maintenance for long life and efficient working of your unit.